I love […] the way the world turns silent when covered in snow. There are many different ways to celebrate the four Advent Sundays in Scandinavia. Mainly it’s about getting together and celebrating the end of the year and…well…life! Celebrate one of the Advent Sundays outside. Play in the snow: remember there is no such thing as bad weather, only the wrong clothes. Serve hot drinks, salmon sandwiches, and ‘nisse’ (elf) cake, make a stew and bake bread over the open fire; I’ll show you how […]. More than anything else, Scandinavian Christmas – Over 80 Celebratory Recipes for the Festive Season is a veritable delight to both behold and partake in. Not only does it lend an entirely different slant to that of the Festive Season – which, given that all these rather wonderful, mouth-watering recipes are anchored in Scandinavia, ought hardly be surprising – it’s also something of a quintessential inspiration. Prime reason being, Trine Hahnemann, fundamentally arrives at these festive meals by way of an entirely different route from that of which most of us are used to. Let alone consider. Whether it’s Warm Chicory Salad, Roast Pork with Spices and Crisp crackling, or Rice Pudding with Cherry Sauce (‘The Christmas Eve Feast’); Salted Cod and Kale Pesto on Celeriac Brushetta or Mini Root Vegetable Cakes with Horseradish Cream (‘Christmas Party’). There is indeed, an abundance of ‘newness’ involved here; and whenever things are new, they cannot help but thus invariably inspire. As a result of Hahnemann going out of her way to substantiate the need to ”create your own celebrations on your own terms,” is precisely what accounts for Scandinavian Christmas being such an inviting and alternative template. Divided into seven sections (‘Christmas Baking,’ ‘Gifts from the Kitchen,’ ‘Advent: A Whole Month of Christmas,’ ‘Festive Brunch,’ ‘Christmas Party,’ ‘The Christmas Eve Feast’ and ‘Christmas Day Smorgasbord’), this hardback celebrates a hybrid of traditional treats and the most sumptuous of modern-day, Scandinavian recipes. Replete with more than evocative photography, I’d have to say that this book isn’t just for Christmas, it’s for many (potentially elongated) fun times in the kitchen – the coming together of the aforementioned ‘Nisse’ (elf) cake on page fifty-seven especially. Author of the food blog Mrs. Wheelbarrow’s Kitchen and a contributor to The New York Times, The Washington Post, Garden and Gun and Southern Living, Cathy Barrow is something of an all-rounder when it comes to the kitchen and most things of a preservation persuasion. Be it the core techniques of water-bath canning, advance techniques for pressure canning, salt-curing meats and fish, smoking or even air-curing pancetta(! ), every application is herein laid forth by way of easy-to-digest, confidence building instructions. Replete with Conversion Tables on the inside of each cover, this attractive and rather elegantly laid out book traverses a two-fold approach. The first is informative in the sense that one can learn (”The pages that follow offer an education in four types of preserving. This where we will begin together, but where you end up is your decision. While I have an extensive preserving plan, what you do needs to fit your lifestyle, the foods you love, and the way you eat”), while the second is more akin to that of most cookery books – wherein there are a number recipes with which to brighten up the pallet. Sectioned into four distinct chapters: ‘The Basics of Water-Bath Canning: Answering the Siren Call of Seasonal Seasonal Abundance,’ ‘Canning Under Pressure: Groceries You’ll Never Have to Carry Home Again,’ ‘Salt, Water, Smoke, and Air: Alchemy in the Kitchen’ and ‘Curds and Whey: Why Buy the Cow;’ Mrs. Wheelbarrow’s Practical Pantry – Recipes and Techniques for Year-Round Preserving is nicely augmented with a terrific selection of colour photographs. The latter being a good thing, as they help break-up what can on occasion, seem like quite a dense, gastronomical journey. In a way, this rather compact aspect, along with it being anchored in Americana, does – for English and European readers at least – take some getting used to. But once this has been achieved, these 404 pages (excluding Acknowledgements and Index) could well be construed as being an essential addition to that of most kitchens (far and wide). Meanwhile, if you want to really come to terms with ‘Marinated Roasted Red Peppers,’ ‘Le Peek-el: The Cornichon Imposter,’ ‘Dill Pickle Relish’ (one of my personal favourites), ‘Beef and Vegetable Borscht,’ ‘Maple-Bourbon Bacon’ (ace – trust me! ), ‘Chai-Spiced Plum Preserves with Balsamic,’ ‘Duck Confit’ or any number of desserts (‘Cardamom Peach Pie Filling’ and ‘Peaches in Ginger Syrup’ among them), you could do a lot worse than invest in this superb, well-designed and altogether practical/preserving induced of cookbooks. What I found most appealing about Rick Bayles’ More Mexican Everyday, was its seemingly suave and overtly sensible approach; especially with regards the second part of the book’s title: Simple, Seasonal, Celebratory. After all, most cuisines of the world, with the possible exception of French, could just as easily be considered simple, seasonal and celebratory. Although, for some unbeknown reason (probably music, colour and a tempestuous history) said three words do sound resoundingly pertinent to that of yer Mexican design. Whether or not this is due to much of Mexico’s approach to life in general being somewhat celebratory, or due to a large part of its gastronomy being relatively simple and of an obviously seasonal persuasion, is open to debate. Moreover, what isn’t open to debate: is the vibrancy and acute, alluring zest of Mexican cooking – of which these 364 pages are a perfect example. Broken into three prime sections (Part One: Simple Ways to Create Dynamic Flavour; Part Two: Vegetables at the Heart of the Mexican Kitchen; Part Three: Daily Inspirations for Busy Cooks), More Mexican Everyday really does traverse all areas of what one essentially needs to know in order to serve up a great tasting, Mexican meal. From rice dishes to skillet tacos to appetising soups (such as ‘Mustard Greens Soup with Poblanos & Almonds’ and ‘Creamy Rice Soup with Poblano & Spinach’), to surely two of the country’s most renowned and rewarding of meals: Carna Asada (Cena Completa de Carne Asada) and Pan-Roasted Summer Squash with Garlic Mojo and Guero Chile (Calabacitas Rostizadas al Mojo de Ajo con Chile Guero), there is herein, a grand variety from which to pick and chose. It covers a simplistic kitchen terrain of thought which at first, might not appear terribly important – but invariably will as time goes on. throws a meal together for someone else is doing something generous. As it’s summer, I thought it might be thoroughly appropriate to review The Great British Bake Off Winter Kitchen – a book that goes some way in inspiring one to generally shake, rattle and role in the kitchen. The last sentence (”in eating in sympathy with the seasons”) ought to be especially pertinent when traversing betwixt supermarket and kitchen. Reason being, so many budding chefs – those with a penchant for gastronomic fecundity at least – appear to take such cuisine induced common sense for granted. This is where the importance of this book comes in – as it’s one-hundred and thirty (relatively) new recipes entice one into venturing much further so far as the palette of ye never ending winter months are concerned. From comforting and hearty soups (”You can make a soup out of almost anything, so try to be imaginative in your kitchen, using what you have to hand […]. Lentils and pulses make great soups, giving substance and texture […]. Leftovers are another good starting point for a soup. Don’t throw away those few roasties or scoops of cauliflower cheese from Sunday lunch”) such as Spiced Potato and Coconut or Lemony Chicken Broth with Orzo Pasta and Chard. Or literally, the very first recipe of this book, White Bean, Smoky Bacon and Savoy Cabbage, which is relentlessly fab. 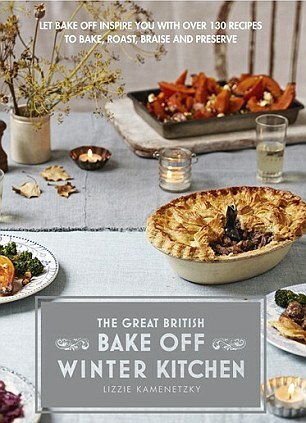 Along with sections on Slow Cooking and One Pots, Pies and Tarts, Puddings, Breads and Bakes and of course, Seasonal Occasions, I can honestly say that The Great British Bake Off Winter Kitchen is an all round splendid book. The recipes are clearly laid out, most, if not all of the ingredients are easily attained, while many of the dishes are themselves, not overtly obvious – an aspect of the book I found most appealing. So there you go, before the autumnal months are upon us, have a delve into this here book. You won’t in the least be disappointed. Absolutely fabulous. Did I say fabulous? Indeed I did. 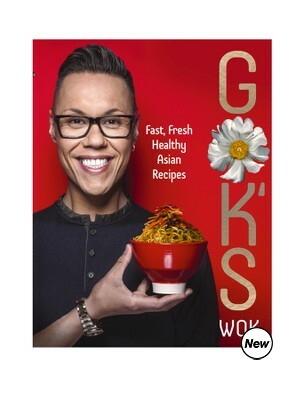 Gok’s Wok – Fast, Fresh Healthy Asian Recipes is a joy of a book to behold, embrace and partake in. That it perfectly reflects Gok Wan’s personality – these 223 pages are unsurprisingly colourful, exciting and friendly – ought hardly be surprising. Reason being, it was always going to be a given that were the fashion expert and award-winning televison presenter to publish another cookery book (the first being his Gok Cooks Chinese), then this would probably be the outstanding result. It’s ten chapters are, as already mentioned, colourful, exciting and friendly. Colourful, because much of the exquisite photography lures you into wanting to try out nearly all the recipes immediately. Exciting, because the recipes are a little different from your lazy staple of meat and two veg/pasta dishes that find themselves on the average family table on a weekly basis. And friendly, because the cooking itself really is simple while the ingredients are more than readily accessible. There’s none of this poached partridge drizzled in truffle oil nonsense, which can so easily turn just the shopping aspect alone, into a grind of a nightmare. So yeah, my partner and I tried the Filipino Pork and Mango Curry, which, apart being super sensational, was something of a simple and non-time consuming dish to make. It has to be said that once we’ve worked our way through the many other splendiferous offerings, it will most certainly be added to our menu on a regular basis. Moreover, what makes Gok’s Wok so exciting, is that it looks so great. As such, photographer Romas Foord and food stylist Robert Allison warrant full credit for having undertaken and delivered a most meticulous and marvellous result. So much so, that I really would have liked a photo for every recipe, but then this is perhaps sheer indulgence. I just adore the wonderful artwork too much I guess. Well I for one, am most pleased Gok Wan has decided to pass it on. For as mentioned at the outset, this really is a joy of a book to behold, embrace and partake in. 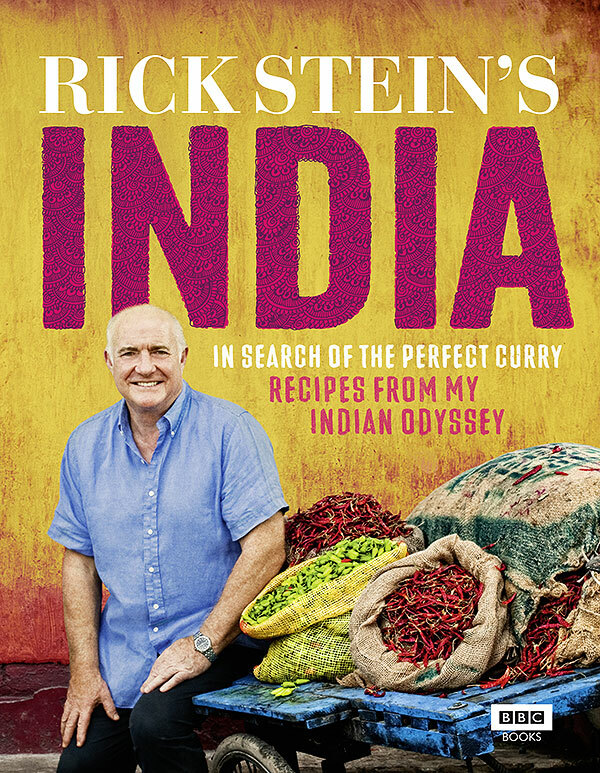 I have to confess, Rick Stein’s India – In Search of the Perfect Curry, is as much a lavish photography book as it is a cookery book. Indeed, James Murphy’s spectacularly taken photographs do just as much to trigger the gastronomic taste buds into doing the rumba (quick time), as do numerous recipes herein. What’s more, the sub-title of this cookery book, In Search of the Perfect Curry, is highly indicative of the author. Having already reviewed a number of Stein’s books – who I once met at a party in Cornwall, and who I have to say, is one of the most unassuming of people I have ever met – it does appear that he is something of a perfectionist. After all, is there such a thing as ‘the perfect curry’? Perhaps yes. Perhaps no. Which ever way, I do know what he means. Such honesty is just one of the traits that is endearing about Stein. Not only does it allow him a certain gastronomic leeway, but it suggests that he, like many a novice in the kitchen, is fully prepared to learn. And I have to say, all lovers of a good curry, let alone a perfect curry, will find lots to learn about amid this thoroughly well presented and, glorious book. I’ve already learned something from the headings of the six chapters alone: Dhaba (”…are street snacks the most irresistable food in India?”), Sabzi (”…succulent vegetable dishes, transformed by spice”), Macchi (…the incomparable taste of fish and shellfish, coconut, tomato, tamarind and spice”), Murgh (…spicy and creamy chicken curries, fragrant rice dishes and a little roast duck”), Gosht (”…deep and dark meat curries, kormas, pulaos and biryanis”) and Meetha (…kulfi, nimish and some other indulgent Indian sweets”). Is this cookery book mouth watering?